What Does Code P2118 Mean? OBD II fault code P2118 is a generic code that is defined as “Throttle actuator control (TAC), throttle motor current – range/performance problem”, and is set when the PCM (Powertrain Control Module) detects that the input voltage in the throttle control motor’s control circuit falls outside of the expected/desired range, or that the throttle control motor does not perform as expected. Note that code P2118 only applies to applications that use “drive-by-wire” throttle control systems in which there is no physical link between the accelerator pedal and the throttle plate. In modern “drive-by-wire” throttle control systems, throttle control/movement is accomplished by actuating a DC motor that is connected to the throttle plate via a set of drive gears. In a fully functional throttle control system, a dedicated position sensor monitors the position of the throttle plate, and both this sensor and the accelerator pedal position sensor work in conjunction to verify the position of the throttle plate. In terms of operation, the PCM uses input data from two or more variable resistance position sensors both to monitor the position of the throttle plate at all times, and to control the movement of the throttle plate. Typically, though, one position sensor monitors the position and movement of the accelerator pedal, while another position sensor monitors the position of the throttle plate. If the accelerator pedal is depressed or released in a fully functional system, the changing resistance in the pedal position sensor causes the PCM to either open or close the throttle plate by an amount that corresponds directly to the position of the accelerator pedal relative to a minimum stop position. To improve overall performance of the throttle control system, the throttle control motor has its own dedicated (and precisely controlled) power supply circuit that is designed to work within very narrow parameters. Thus, when the PCM detects that the voltage in the throttle control motor’s power supply circuit has fallen below a predefined minimum threshold, it interprets the low voltage as a “[voltage] range or performance” problem, and it will set code P2118 and illuminate a warning light as a result. Also, note that since an out-of-range voltage in the throttle control motor’s power supply circuit means that the PCM cannot control the throttle effectively, the PCM will also initiate a failsafe or limp mode as a safety precaution when code P2118 sets. When this happens, and depending on the application, throttle response may be severely limited or prevented altogether, and on some applications, it may not be possible to start the engine. Moreover, regardless of the severity of the failsafe or limp mode, the application will remain in limp mode until the problem is resolved or corrected. Where is the P2118 sensor located? 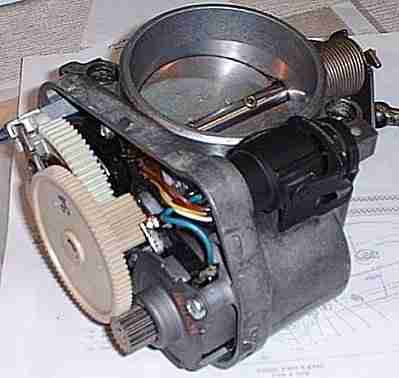 The image above shows an example of a typical “drive-by-wire” throttle control mechanism that forms a part of the throttle body assembly. In this example, the actual DC motor is indicated by a red arrow, but note that although all motorized throttle control systems follow the same general principles of operation, the appearance, design, and layout of individual components (relative to each other) within the throttle body vary greatly between applications. Note that on many, if not most applications the throttle control motor forms an integral part of the throttle body assembly, and cannot be replaced on its own. In these cases, the entire throttle body assembly must be replaced as a compete unit. What are the common causes of code P2118? NOTE: Code P2118 is often accompanied by other throttle control related codes, any one or more of which could have caused, or contributed to the setting of P2118. Therefore, it is important to resolve additional codes in the exact order in which they were set and stored, since failure to do this could result in a misdiagnosis, and the unnecessary replacement of parts and components.